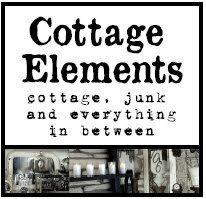 Cottage Elements: Putting a Little Light on the Subject! I came across a delapitated wood settee at a yard sale for a mere $5. I couldn't pass it up. But when I got it home, I decided it was beyond repair. 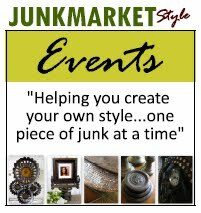 So what's a junker to do? Why make something else out of it of course! I purchased three of these bathroom cup holders at a flea market a few years back for $5 a piece. They work perfect to hold candles. I dismantled the settee, and took the back piece (which was already painted white) and attached the cup holders. Instant wall sconce! These small juice glasses are new, but thought they would be cool accents to the cup holders. All I needed now was some candles. You can use tea lights, too, but I just liked the looks of these. I think it fits perfectly above the vintage desk I have. And I love this "Family" sign above it. A local photographer created the letters from architectural pieces in the area. I've seen them in catalogs, but love the fact that it's from my community! A small portion of my white pottery adds the finishing touches! 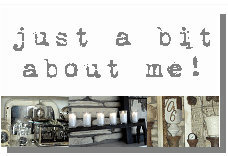 I love your candle holder...great idea...and it all goes so lovely together. The cups are perfect! Once again you have done an amazing job. Love it. Fab...u...lous! Great mix of materials Lani! It was clever to dismantle the furniture piece. I like the etching or printing on the glassware. I love this! Being so creative should help those winter blues too! See that's my problem. I'm missing the creative gene like you and Amy possess. I'll have to check and see if there are any doctors who can do a junk transplant...are you willing to be a donor? Great job of thinking "green"! Everything looks so wonderful! I am such a fan! Oh my gosh - I love that!!! What a fantastic idea!!! ;-) Thank You for coming to visit me!! !